My elementary school bus driver didn’t speak Spanish, but the few phrases she’d memorized were scary as mierda. ¡Cállate! ¡Silencio! ¡Sentarse sin hablando! She’d sweep the back of the bus with her omnipotent glare and scowl into the rearview mirror. If she made eye contact, you were as good as muerto. I grew up in a farming community where half of us rooted for Mexico and rest backed Italy. The gringos jóvenes had no clue what she was saying, but her threat—however foreign—scared the bejeezus out of us all. If you didn’t shuttheHwordupRIGHTNOW then you’d have to sit at the front of the bus with *gasp* the nerds. Sitting up front was worse than getting a yellow card. It meant you’d miss out on everything. Maybe Suzette would finally kiss Jose. Maybe you’d barter your chips for a Lunchable. Maybe Antonio would stick his hand out the window again, and it’d get knocked off by a tree branch. He was a brave, but dumb, boy (weren’t they all? ), and we were easily entertained. To sit up front meant you’d lose your front-row seat to all the action and, thus, your social standing for days, if not weeks. The horror. I was a regular at the front of the bus (shocker). With horrible motion sickness, my hour in that yellow tank was hell. I passed the time talking to the bad kids (re: cool kids) who really didn’t want to sit next to the chick in penny loafers with her eye on the vomit bucket. But I won them over with my charm. Or they were bored. Either way, I spent a great deal of time chatting. They didn’t adopt my sense of style, but I was quick to mimic their behavior. From first grade all the way into middle school I never, ever ¡Cierras la boca! Apparently I haven’t changed much since third grade because my bus driver’s warnings still fall on deaf ears. 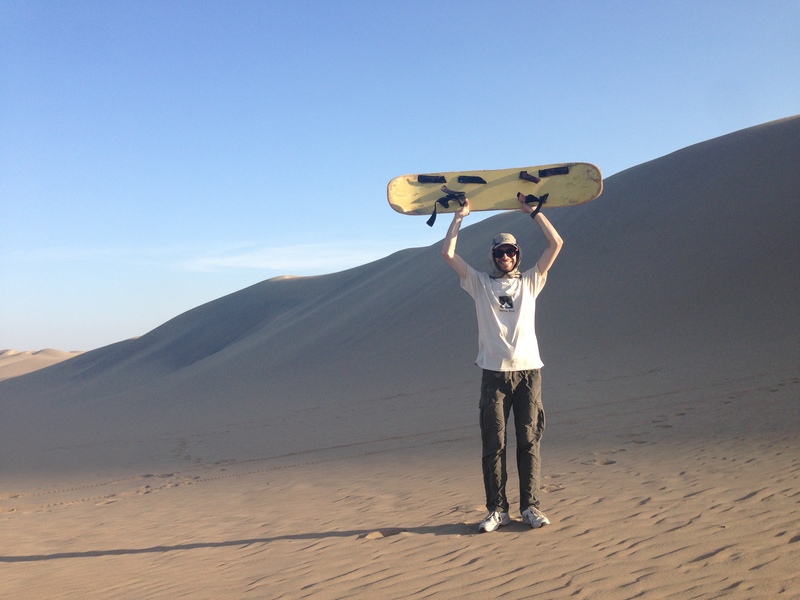 A few weeks ago, I found myself standing at the top of a HUGE sand dune in the Peruvian desert, clutching a sandboard in shaky hands. Sandboarding is kind of like snowboarding but not. 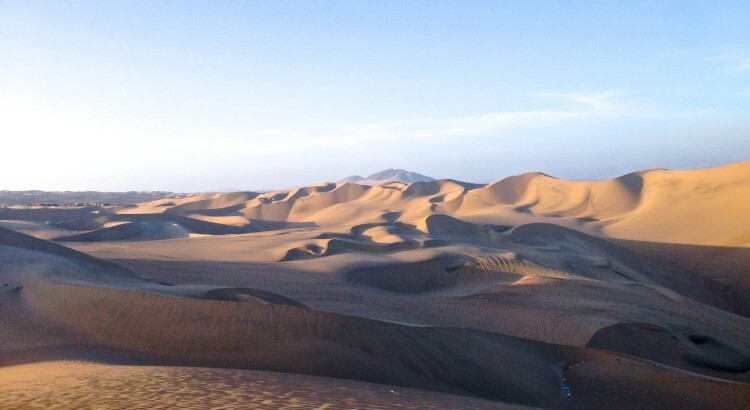 The Huacachina desert is far more gorgeous than a snowy mountain. 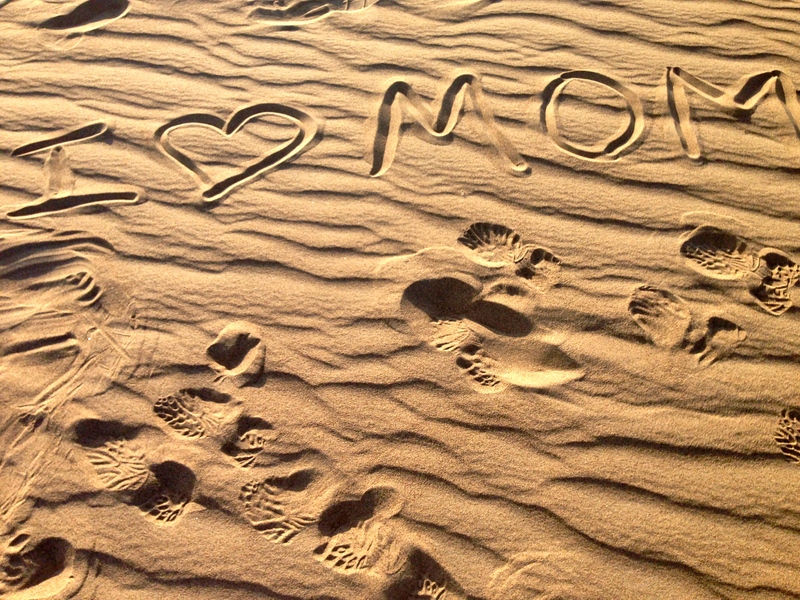 However, face-planting in sand is a lot less thrilling than belly-flopping into a snow drift. While our tour guide mechanically waxed my sandboard, he waxed poetic about the many ways white people have screwed up this sport—enough to land themselves en el hospital. Muy peligroso. He laid out his list of do’s and don’ts in perfect Spanglish: Don’t lean forward. Never hold your hands out in front of you. Always keep your torso curved upward. But his main advice? ¡Cierras la boca! Awesome. 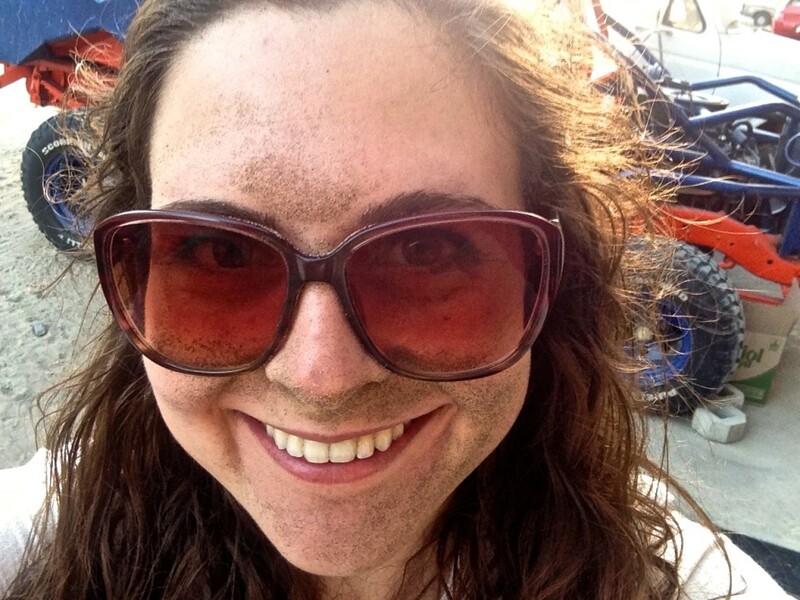 I have a similarly sand-faced photograph from my time in Peru. Also —that sand-burn is a b*tch compared to its snowy cousin.